I tentatively pre-ordered this book a while ago and once it arrived I decided to jump straight in and read it. I say tentatively because if I’m being real, I didn’t exactly love Glass Sword. It was okay but it certainly didn’t reach my expectations. So understandably I had pretty low expectations for King’s Cage, but my hope was still there. I’m really glad that I continued with this series because I enjoyed King’s Cage way more than Glass Sword. King’s Cage picks up not long after the end of Glass Sword. Mare is being held captive by Maven and hidden away with the restraint of silent stone placed upon her. With glances back and forth between Mare’s situation and the rest of the Scarlet Guard, the main course of action for this book was whether or not they would be able to rescue Mare. Queue lots of political talk and a fair bit of action and overall this was a great read. I thought there was a lot more point to this book. I could sense the direction of the plot and was also interested in the political elements. There were certainly some interesting twists in this book and it will be interesting to see where the fourth and final book will take us. This series is a little wordy but Aveyard has certainly built up enough by now for there to be a great conclusion to the series. I really LOVED that the POVs were from the female characters and it was refreshing to get chapters from the POV of Cameron and Evangeline. I was pleasantly surprised by how much I liked Evangeline in her chapters too. If I had to pick something that irked me a bit though I just REALLY wanted more from Farley. She is my favourite and although she was there in the book, I just really wanted her to come more to the front. I need to talk about Mare. I really resented her in the last book, I thought she was cold, selfish and I just could not connect with her. As her circumstances have now changed, we finally see a slightly different side to her. She is much more human and emotional and I was able to start to have some form of connection with her. I’m not sure she will ever be my number one heroine, but she certainly had a lot more integrity in this book and I much prefer the new Mare. Overall I enjoyed this book and was surprised at how quickly I read it. There are some great characters in this series and I hope we will see more from them (aka Farley) in the final book! 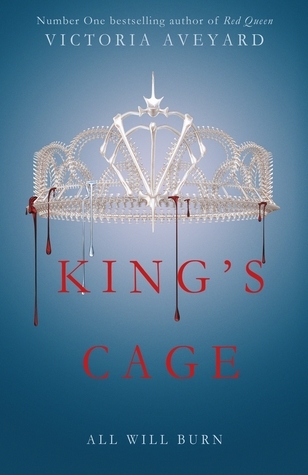 Have you read King’s Cage? What did you think? Are you a fan of the Red Queen series? I couldn’t believe that I wasn’t resenting Evangeline when her chapters finished, it was quite unexpected by Aveyard to do that. Really looking forward to the next one as this was just a brilliant book! I’m really glad you enjoyed this book. I have only read Red Queen and it was an okay read for me but I am willing to give this series a try. Now, I am looking forward to start this series once again. Great review! I had a very bad experience of book 2 and I’m still not sure if I want to read this one. From your review, I see we finally get other POVs. Do we get quite a lot less Mare? Or is still most of the book her POV? If I know before going into it there’ll be a lot less time stuck in her head, then I might give this a try! There are more POVs but the majority of the book is still from Mare’s POV. She is slightly more bearable than in book 2 as she is a bit more relatable.